Here for you is my new Free Motion Quilting Design #108. This dainty flying creature just appeared while I was doodling some flowers. The winning name was chosen at 6:00 PM (Pacific), Sunday April 7 (2019) by popular vote on Facebook and Instagram. This designs new name is "Flutter Bye". Thank you and congratulations to Lori Butler of Nanaimo, B.C. To make your ¼ inch seam accurate we must address three basic steps. Working with the true straight grain of your fabric will make sewing your pieces together easier and more accurate. If you straighten an edge using only a single fold or the selvedge edge as your guide then you are more likely than not to get strips that have a “V” or “WOW” in them. All sub cuts made from the resulting strips will be slightly off grain making them want to twist as you feed them through your sewing machine. This will affect your ability to sew a consistent ¼ inch seam. To prevent this place the fold of your fabric towards the top of your cutting mat. Fold the selvage edge towards but not all the way to the fold at the top of your fabric. 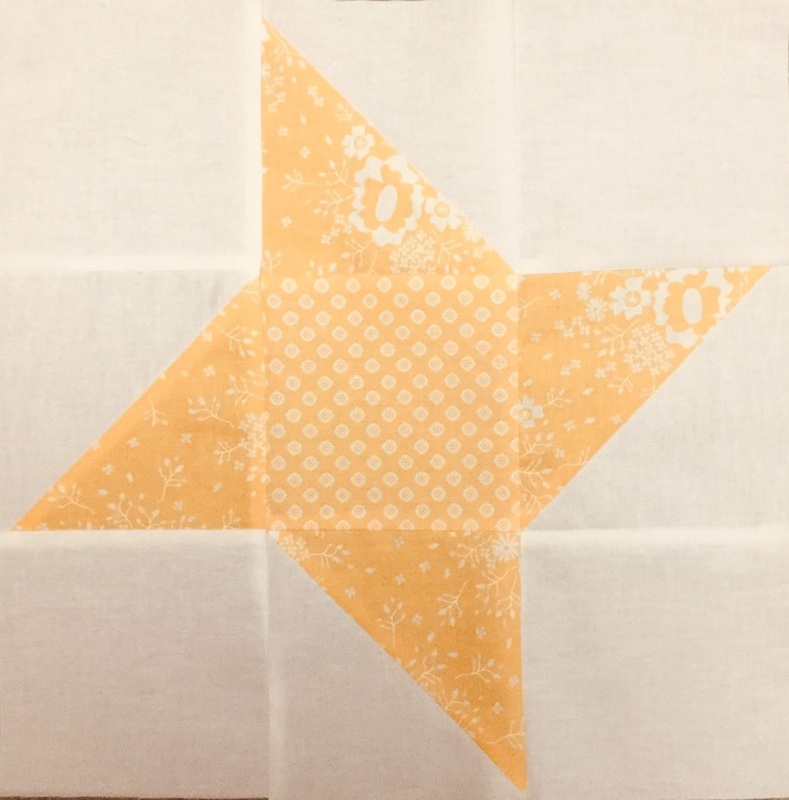 Measure from fold to fold with your quilting ruler. Use an easy measurement to view on your ruler such as anything on the ½” or 1” line. When you get the same measurement across the length of your fabric then you are “On Grain” and ready to straighten an edge. Don’t try to straighten more than 25” to 30” at a time. It’s better to re-measure and re-straighten as required. Now…use one of the long horizontal lines on your ruler to line up to the bottom fold of your fabric. The other lines should be square to your top fold. Trim a little bit of fabric off the side to “straighten an edge. If you are right handed you will straighten from the right and cut your strips from the left. If you are left handed you will straighten from the left and cut your strips from the right. When cutting your strips be sure that the line you are measuring is ON TOP of the straightened edge. If your measurement line is on the outside of the cut edge you will “lose” approximately 1/16” to 1/8” of fabric. It doesn’t seem like much but by the time you have cut eight strips you have “lost” up to an inch in the accuracy of your measurements. No matter how well we sew if our cutting is out our blocks will still be the wrong size. If you square your body to your ruler it won’t slide out of place and you will not need as much pressure to make your cuts. This is accomplished by simple physics in that all your weight is automatically transferred down into the table so that your ruler stays in place and your cutting hand has more power without more pressure. To be sure that you are square to your ruler stand with your feet flat and side by side and line your “Belly Button” up to the hole in your ruler. It’s easy to remember because it will make you laugh…and it works! I generally use 50 weight cotton thread with a sharp needle when piecing cotton. Good needle choices include Quilters size 75/11, Jeans Denim size 70/10 or Microtex Sharp size 80/12. If your fabric is a blend of poly/cotton you may use poly/cotton construction thread. 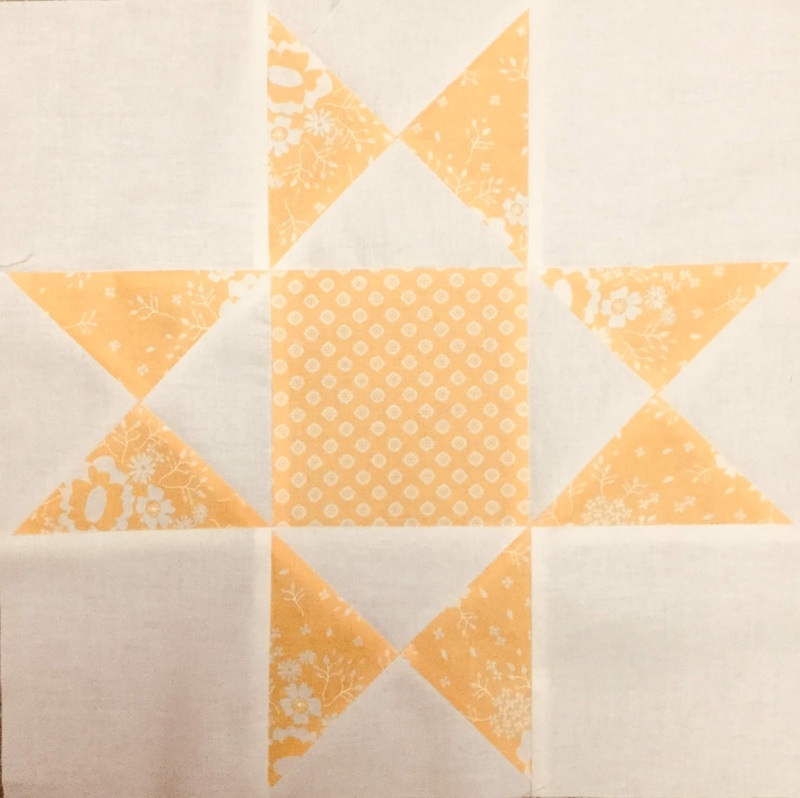 If quilting with polyester, piece with 50 weight polyester thread. Though weight is the most common way that we compare threads it is only accurate when you compare threads within the same category and with the same number of ply. For instance a 50 weight cotton three ply will be thicker than a 50 weight cotton two ply as the thread is 50 weight per ply. A cottonized polyester will be different from a filament polyester. A measured ¼” is the measurement that is on a ruler. Most patterns, books etc. will tell you to use a ¼ inch seam allowance to piece your quilt. 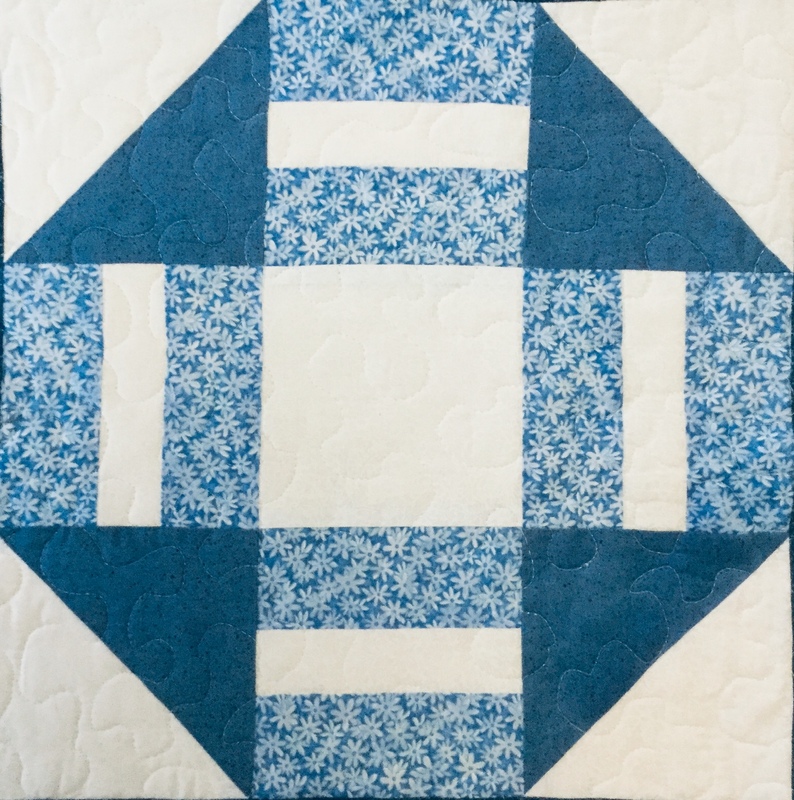 It is assumed that quilters know to piece with a “scant” or “quilters” ¼ inch seam allowance. We sew with “just under” a measured ¼ inch to allow for the width of our thread as well as the fold over of the fabric in our seam allowances. You may need to adjust your seam allowance according to the thickness of your fabric and the thickness of your thread. Pressing your seam allowances open will give you a slightly different measurement than pressing all seam allowances to one side. Simple designs consisting of pieces that are all the same size can be pieced with a scant or generous, (measured), ¼ inch seam. The more complex the design, the more careful you need to be to sew an accurate seam allowance. The moveable needle position in straight stitch on our computerized sewing machines allows us to fine tune the ¼ inch seam to achieve perfect results for every project. A good way to set your machines needle position is to sew a test block consisting of six strips, 1 ½ inches wide by 6 ½ inches long. It should be exactly 6 ½” square. If it is too small or too large then adjust your seam allowance accordingly. If you do not have a computerized machine there are a variety of ¼” guides available to help you sew an accurate seam. 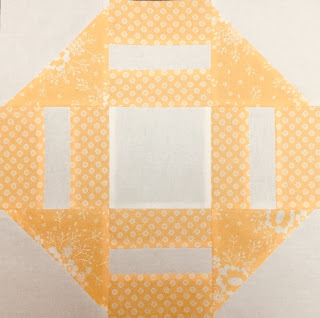 I find that a piece of Moleskin (a thick cushy adhesive bandage), available from any drug store, stuck to the bed of your machine to the right, front of your needle, will allow you to sew more accurately than a flat tape such as masking tape. Sitting correctly at your sewing machine will reduce stress to your body and allow you to sew more accurately. If you are sitting too high or too low you will not be able to sew a straight line because your depth perception will be off. You should be able to reach out with your arms at a 90 degree angle and gently drop your hands into place. Center your body to the sewing bed. Look ahead to where you want to be sewing. Keep your eyes in front of the needle. If you look at the needle (it can’t jump out and get you) then you will drive a crooked line. Look to where you want to go and you will stay on the straight and narrow. Press, don’t iron. Let your iron do your work for you. Set your seams from behind by putting heat and steam (if desired) on top of the seams before trying to press them open or to one side. Use the weight of the iron to either push the seam to one side or press the seam open. When pressing the seam to one side, have the fabric you want the seam to lay towards facing up and push the top fabric towards the seam allowance. Your seam allowance will be pressed to the correct side with no little creases. By using these simple steps you will have wonderfully accurate ¼ inch seams. 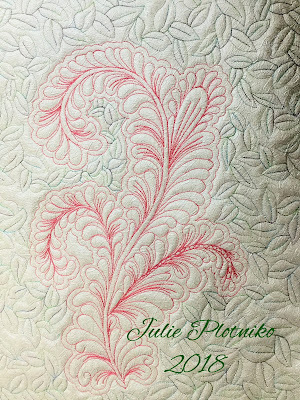 This weeks new Free Motion Quilting Design has that wonderful organic feel that would make it a great background fill. Stitched with contrasting or variegated thread this design could easily be the star of the show! The winning name as chosen by popular vote on Facebook / Instagram on Sunday March 31 at 6:00 PM (Pacific) is "Bachelor Buttons". Thank you and congratulations to Philippa Zapf of Nanaimo B.C. The winning name of "Fern-wood" was suggested by Roy Plotniko of Parksville B.C. Well done Sweetheart, what a special name in honor of a very special lady! Now all I have to do is to get you stitching! I had a fabulous time at Creativ Festival Victoria and Abbotsford teaching so many enthusiastic new and returning students. My Lecture/Demo Perfect Your 1/4 Inch Seam was full to the brim with students excited to learn the secret to accurate piecing and perfect points. As this continues to be a struggle for many quilters I have decided to post a brief follow up tutorial on the subject. This tutorial will serve as notes to those who have taken the class and as a great start point to those of you who would like to take this class with me. 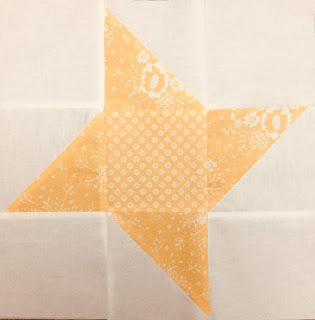 An accurate 1/4" seam results in perfect points and a block that is the desired size. 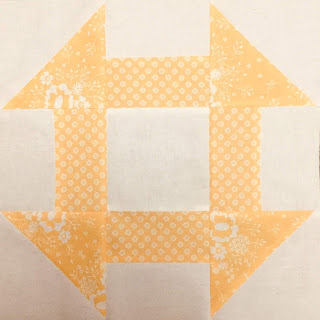 In my hands on class, Timeless Traditional Quilt Blocks students learned how to make five of my favorite traditional blocks along with even more tips and tricks for perfect piecing. This hands on class pairs beautifully with Perfect Your 1/4 Inch Seam. 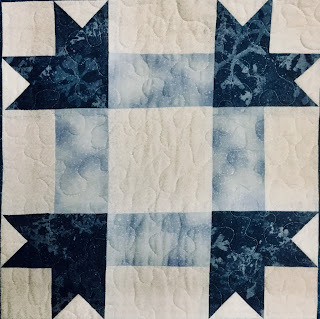 There was much laughter and excitement as students some experienced and some brand new to both sewing and quilting revealed their finished blocks, perfect points and even personal block variations. We were provided with lovely Janome Machines to work on. Students started with pre-cut pieces. 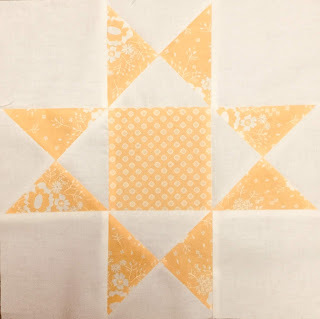 And learned how to make five different blocks! 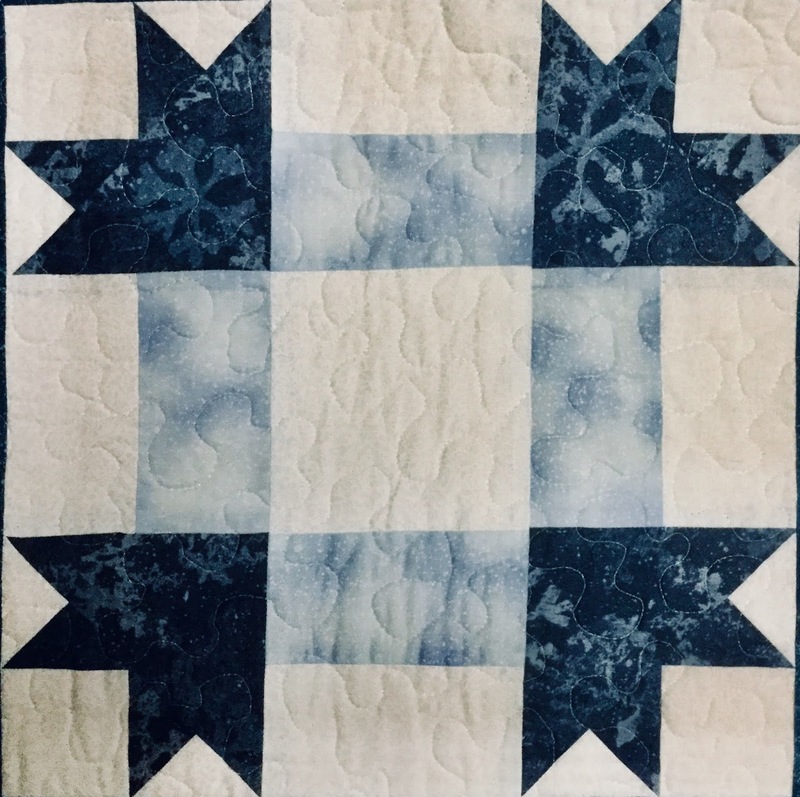 Tips for piecing and correct trimming techniques made our work fun and easy. WOW look at those points! Look at how color placement changes everything! The kit fabrics looking fabulous! Look at those perfect points and fresh colors! WOW and even a perfect first block EVER! Though some were too shy for the camera I loved working with all of both my Victoria and Abbotsford groups. Thank you ladies, you are amazing! Next up was Can I Quilt That. In this Lecture/Demo students were amazed by all the unusual fabrics that can be beautifully quilted for use in a variety of items including purses, jackets, quilts and more. Silk, linen, T Shirt Knits, Tablecloth Plastic, Denim and Blackout Curtain Fabric were just a few of the specialty fabrics discussed. Linen heavily quilted with one layer of cotton batting and two layers of wool batting. Modern Quilting on Blackout curtain fabric. My Lecture/Demo Traditional Goes Modern teaches you how to take everything you have learned about Traditional Quilting and bring it into the fascinating world of Modern Quilting. The influences of Modern Art including Minimalism, Cubism and Pop Art, Amish Quilting and the quilters of Gees Bend Alabama were discussed along with the use of (heavily quilted) negative space, color, scale, repetition of design and even words to create a Modern Quilt that often has something to say. 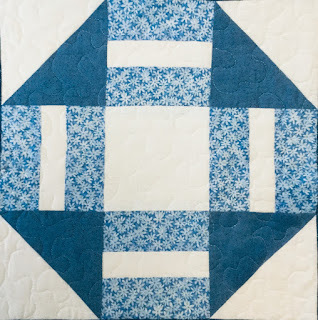 This Lecture/Demo pairs well with both Timeless Traditional Quilt Blocks and Beautiful and Versatile Nine Patch Blocks. 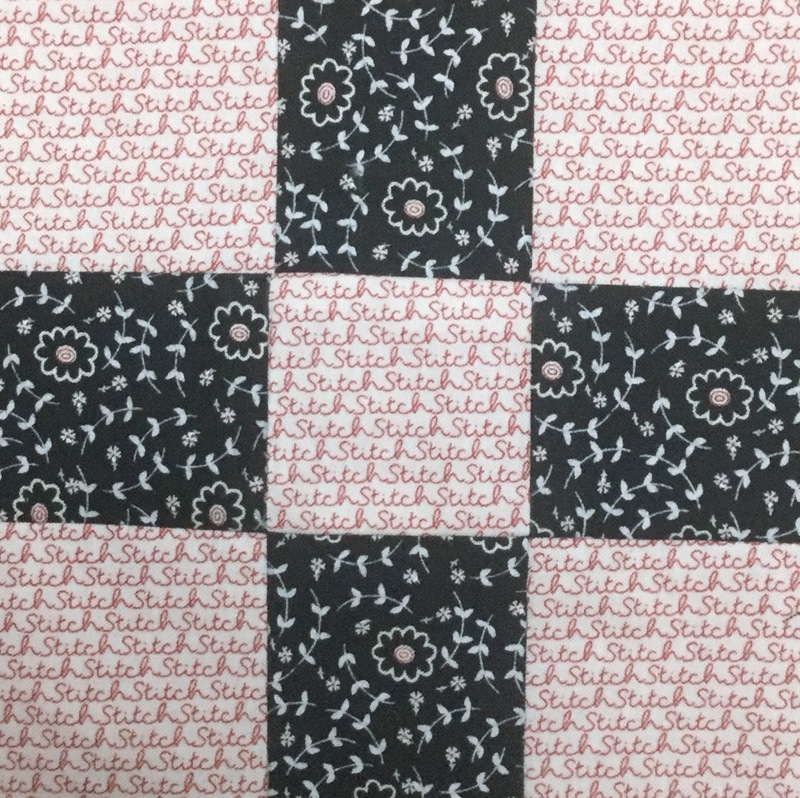 Traditional Churn Dash Block from my hands on class Timeless Traditional Quilt Blocks. Our final Lecture/Demo of the weekend was Beautiful and Versatile Nine Patch Blocks. In this class we examined how an unlimited number of block variations can be created using the nine patch block division. 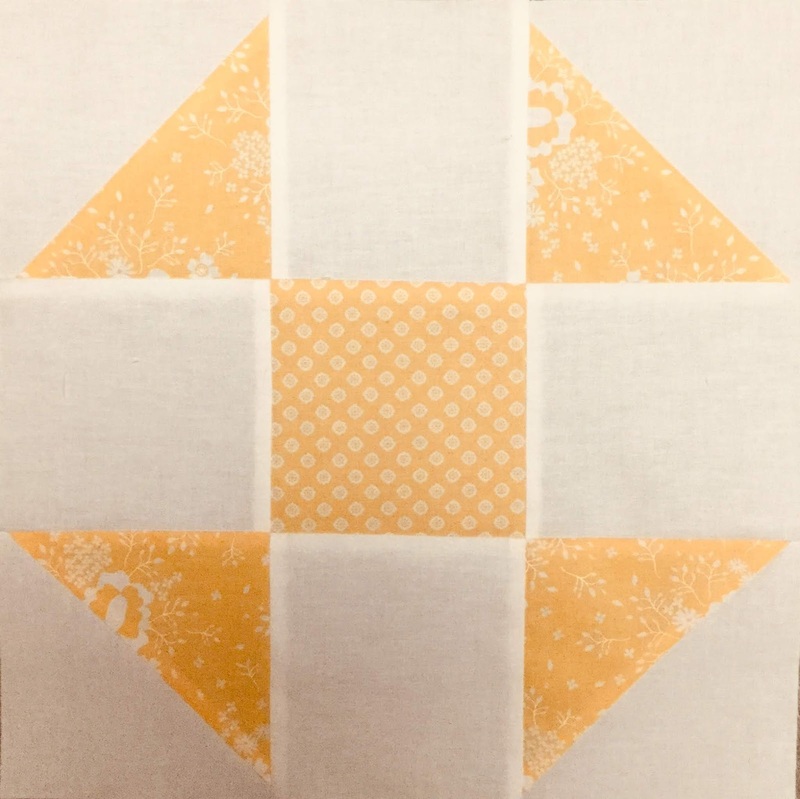 We starting with the simplest form of nine equal squares then explored a variety of pieced variations, the effect of color placement and combining blocks to create secondary patterns. Spring 2020, Victoria Spring 2021. 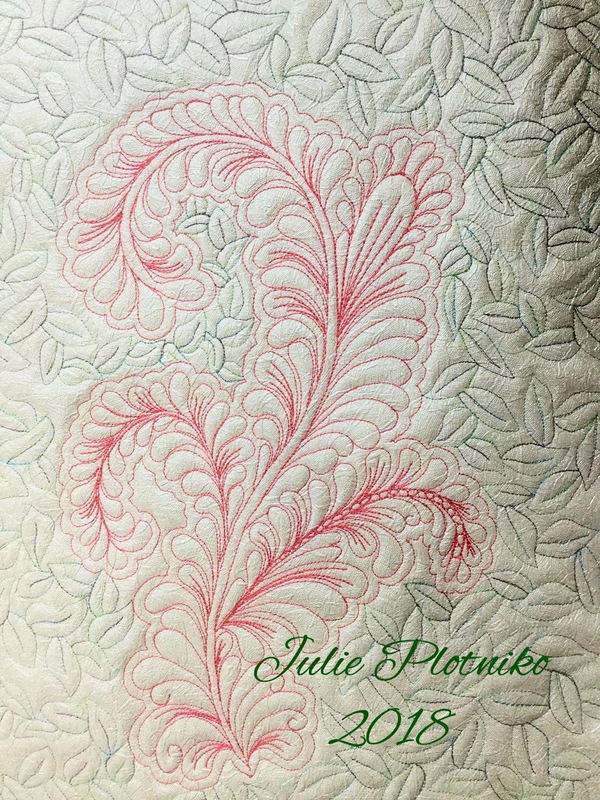 Juslies Name Game, new Free Motion Quilting Design #105. Named "Lazy Daisy" by popular vote here, on Facebook and Instagram, Sunday March 17, 2019 at 6:00 PM (Pacific). Thank you and congratulations to Leslie Graham of Nanaimo B.C. for suggestion the winning name. 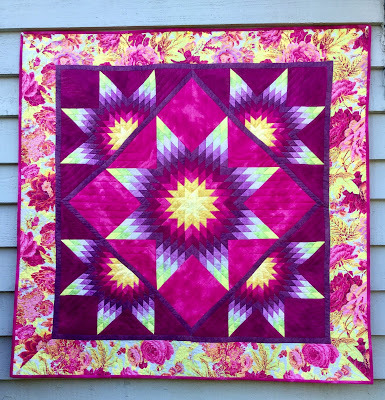 Here is my new Free Motion Quilting Design #104. The winning name, chosen by popular vote Sunday March 10, 2019 is "KokopellI". Thank you and congratulations to Cathy Crawford of Mill Bay B.C. Quick Link to my Favorite Websites. Come and take a class and/or lecture with me. Are you going to be in the Nanaimo (Vancouver Island B.C.) area? Click on the Snip & Stitch Sewing Centre link for my available classes. All information, tutorials, designs and images are the property of Julie Plotniko and Julies Quilt Class and are intended for personal use only. No portion of this site may be copied or distributed without written permission. 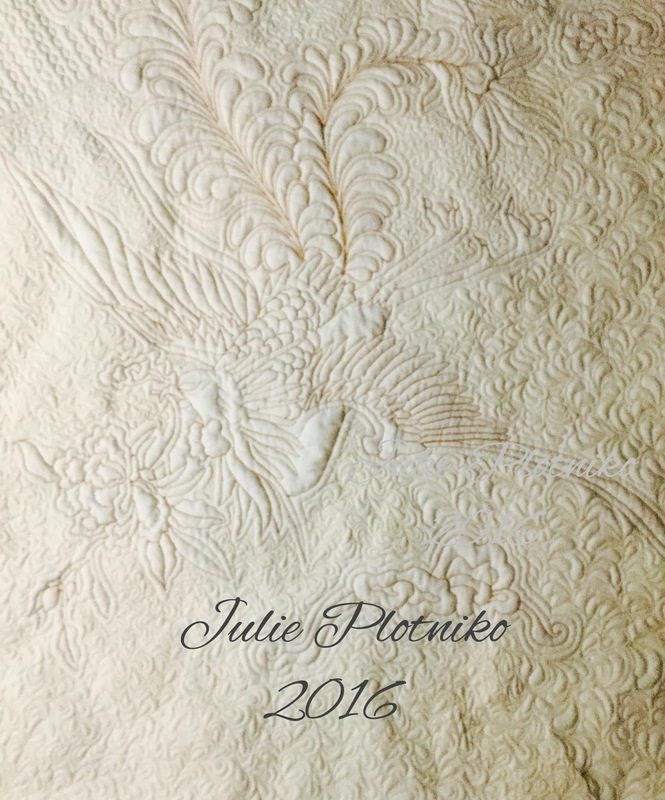 Feel free to share via Pintrest, Facebook, Instagram, Twitter or Google + with attribution to Julie Plotniko and Julies Quilt Class. The opinion expressed in all posts (sponsored or other) is my own. 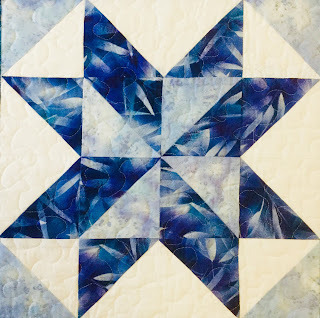 Have you used my designs to quilt your quilt? 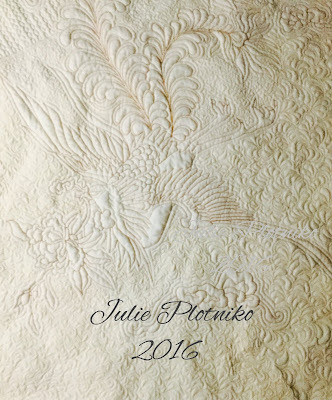 All contents are the property of Julie Plotniko and Julies Quilt Class.. Ethereal theme. Powered by Blogger.